Capturing an individual’s weight at a single “snapshot” in time significantly and consistently underestimates mortality risk attributable to obesity because it fails to factor in high-risk, illness-related weight loss in the formerly obese, new research indicates. The work shows that past obesity is a marker for higher death rates in the same way that former smoking can be, say the researchers. The study was published online January 4 in the Proceedings of the National Academy of Sciences. Together with Samuel Preston, PhD, University of Pennsylvania, Philadelphia, Dr Stokes examined the association between excess weight and mortality using data from the 1988–2010 National Health and Nutrition Examination Surveys (NHANES) that were linked to death records through 2011. A key independent variable in their analysis was lifetime maximum BMI, based on a question in NHANES that asks respondents to recall their maximum lifetime weight, excluding weight during pregnancy. The sample was restricted to adults between 50 and 74 years of age at the time of the survey. In total, 39% of NHANEs participants who had previously been in a higher BMI weight category had migrated down into the normal-weight category over time. As Drs Stokes and Preston point out, this is a large volume of individuals and this downward flow from higher BMI classes to the normal-weight category clearly has the capacity to change survival outcomes of the normal-weight class. 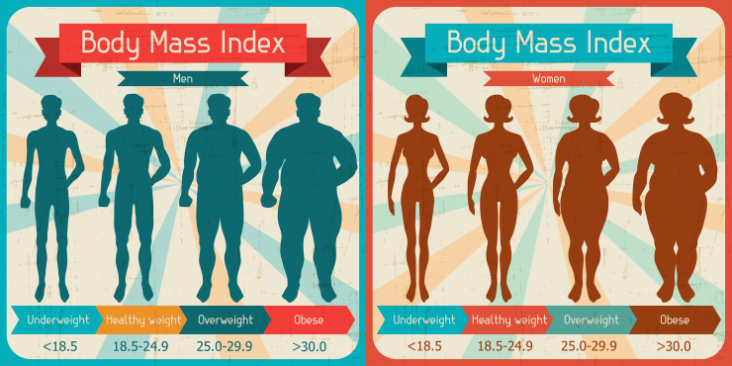 “In both models, each higher BMI category above the normal-weight category carried with it succeedingly higher mortality,” they point out. When maximum weight was used instead of the one-time snapshot of participants’ BMI, the risks associated with overweight increased from 10% to 19% while for those in obese class I, mortality risk increased from 47% to 65% and for those in obese class II, mortality risk increased from 72% to 149%. The authors also calculated hazard ratios for mortality using two other models that combined data on weight at the time of the survey and maximum weight. In these, they differentiated between individuals who were at their maximum weight at the time of survey and those who were below their maximum weight at the time of survey. Results showed that people who lost weight were at a greater risk of dying than those who remained in the higher weight class they had previously occupied. Drs Stokes and Preston also examined the prevalence of diabetes and cardiovascular disease among participants. For both conditions, people who had moved to a lower BMI class had a higher prevalence of both diseases than those who remained in a higher BMI class. “The high prevalence of both diabetes and CVD among people moving to lower BMI classes demonstrates that weight loss is often associated with illness,” the authors emphasize. “An analogy to smoking makes it clear why it’s important to consider past as well as present weight when studying the effects of obesity on mortality,” Dr. Stokes explained. “If you were to compare smokers and nonsmokers, you might arrive at the conclusion that smoking is beneficial and the reason is that the nonsmoking group may include a large number of former smokers whose mortality risk is elevated,” he added. To avoid this bias, Dr. Stokes points out that studies investigating the effects of smoking on death rates have long distinguished between nonsmokers who never smoked and former smokers (nonsmokers who smoked in the past and quit). The goal of dentistry is to help patients care for and maintain their teeth. Compared to previous generations we have made great strides in this regard. Adults today have only a fraction of the restorations and missing teeth of previous generations. Yet despite our best efforts teeth can still be lost to trauma, wear & tear, the slow onslaught of chronic disease and poor anatomy. Ultimately most of us will have to deal with replacing some missing teeth in our lifetime. The options to replace teeth are removable restorations, restorations attached to natural teeth, and dental implants. Over the last 20 years, dental implants have moved to the mainstream of dental treatment. Yet many patients are unsure about the advantages of implants over other restorations. When having to decide between options for replacing missing teeth, patients have to weigh the risks and benefits of each. While each individual situation must be judged on the specifics, below is a list of advantages implant provide that apply to most people. In our appearance centered culture we often overlook the obvious. The primary function of teeth is to help you extract nutrition from the food you eat. Dentures can restore only 20% of chewing efficiency. Simply put, sliding dentures make chewing difficult. Consequently denture patients select foods that are softer that tend to be low in fiber and high in sugar & salt. Dental implants function like your own teeth. They can restore up to 80% of the chewing efficiency of natural teeth allowing you to eat your favorite foods and have a healthier diet. When teeth are lost, bone support for the lower face is lost as well. This loss of support is what gives people a “denture look” when they lose their teeth. Dental implants look and feel like your own teeth. Dental implant restorations can be design to recreate the support for the soft tissues lost with tooth extraction. Dental implants can give you back your smile and help you feel better about yourself. With poor-fitting dentures, the teeth can slip within the mouth causing you to mumble or slur your words. Implants fuse to the bone and become part of you. Because they are fixed in place, implants eliminate the discomfort of loose removable dentures allowing you to speak without the worry that teeth might slip. In addition to providing artificial surfaces upon which bacterial can grow, dentures cover the soft tissue of the mouth preventing the normal flushing of bacteria and yeast organisms. The increases in these microorganisms can lead to inflammation in the soft tissues. Further the physical irritation of the denture rubbing on the soft tissue can produce acute ulcers. In rare cases this chronic irritation can contribute to the development of oral cancer. Maintenance of your natural teeth. Any time dental work is done on a tooth there is a risk of complications. 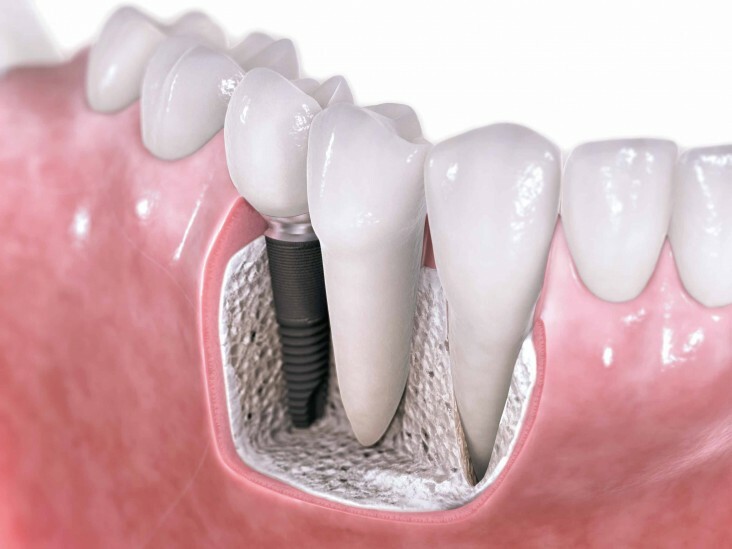 Dental implants don’t require grinding down other teeth, as a tooth-supported bridge does. More of your natural teeth are left unaltered, improving long-term oral health. Individual implants also allow easier access between teeth, improving oral hygiene. Removable dentures are just that; removable. Dental implants can eliminate the embarrassing inconvenience of removing dentures, as well as the need for messy adhesives to keep them in place. Dental implants are the longest lasting dental restorative treatment available. Success rates vary, depending on where in the jaw the implants are placed. Depending on location, dental implants have a success rate of up to 98%. With proper care (see previous posts), implants can last a lifetime.